This entry was posted on May 10, 2017 at 8:51 pm and is filed under 1980s, Music, Rock, Uncategorized with tags Brian May, British, Classic Rock, Freddie Mercury, hard rock, Heavy Rock, Queen, rockabilly, The 1970s, The 1980s, The Works. You can follow any responses to this entry through the RSS 2.0 feed. You can leave a response, or trackback from your own site. Queen went from an amazing rock band to an amazing pop rock band. I didn’t like 80s Queen…until I did! I LOVE the Works. I was kind of the same. If it hadn’t been for some of the other great tracks on the album, I would never have gotten it. Don’t judge me, but I like Radio Ga Ga! I like this whole album too so hopefully that makes up for it! I’m probably the only one here who doesn’t but there is everything to like on the rest of the album. Yeah I’d slap anyone who knocked “I Want to Break Free” too. Classic. LOL, We know now not to say anything bad about that song around you. I’m a bit of a sucker for Radio Ga Ga. Along with Bohemian Rhapsody, it’s the reason I got interested in them a bit in the 90s. I’ve got this album sitting on a list to pick up if I see it… seems to be another that folks recommend. If we bought every album recommended by ourselves or our follow bloggers, we’d all be bankrupt. This is a good one to recommend. No kidding! Not enough money or hours! I love Radio Ga Ga… I think it’s one of their best singles. Tear It Up is one of their best rockers too, it’s awesome. Also love Radio Ga Ga, and the video for it too. A great album by a great band. I’m definitely in the minority in regards to that song. 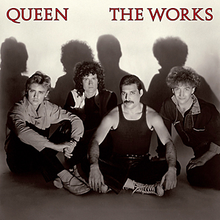 But this is a fantastic album and Queen are a great band. My first post about them has Queen as one of the great metal influences.